Often described as Canada’s Rosa Parks, the 32-year-old Desmond refused to leave her seat in the “whites only” section at the Roseland Theatre in New Glasgow, Nova Scotia, back in 1946. As a result, she was dragged out of the theatre by police and then jailed; it wasn’t until 1954 that segregation was legally ended in Nova Scotia, partly due to the publicity around Desmond’s case. And while we now know the new $10 bill features the exterior of the Canadian Museum of Human Rights in Winnipeg, as well as an excerpt from the Charter of Rights and Freedoms and an eagle feather representing the continuing struggle for recognition of the rights of Canada’s Indigenous people, the question of what was going to appear on the reverse of the bill was still up in the air during Butler-Palmer’s consultation. But does she like the final design? 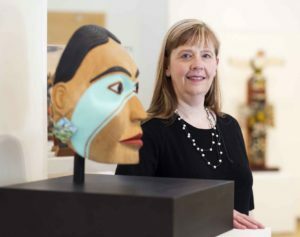 All in all, it was a unique experience for Butler-Palmer, who also teaches an AHVS elective titled “Fakes, Forgeries and Fraud” (returning in January 2019), which deals specifically with art forgery and theft—both of which are popularly associated with money. “It certainly was interesting to be contacted by a federal agency and be asked your professional opinion,” she says. Now that’s news you can take to the bank!